Intrepid Toronto dog lover and cake baker Mary Li, with her husband Douglas, is living temporarily in Nuku’alofa, capital of the Kingdom of Tonga. Here’s a glimpse into her life there. I know most of you were in the Arctic Vortex in February. But that sounds pretty cozy and dreamy to me right now. It’s too hot and humid here. I feel shiny and sticky all the time, from all the sweating! I’ve taken to snorkeling like fish to water, literally. I don’t swim in Tonga every day. There is a reef around most of the island here. From reef to shore, the water is shallow and pretty hot. I am sure you can poach fish in it. What a shock the first time I stepped in. Never occurred to me that ocean water could be hot. No wonder I was the only one in the water. On weekends, we travel further away where there are beaches without a reef yonder and water is much cooler and snorkeling is great. I pinch myself sometimes to see these colourful fish really exist and in such abundance. The bold ones swim my way to check me out. You almost see them go, ‘yikes’ and quickly spin the other way when they realize I’m alive. It’s a magical world in them waters. This is our house and the view across the road from the house. Sometimes we see cruise ships go by in front of our house. A couple of weeks ago, there was a volcano eruption in Tonga 40 kilometres north of us. We could see the volcano dust cloud from our house. When the tide is out, kids and dogs run on the ocean floor. This is downtown – really. It’s early in the day. Sometimes I go into town with Douglas so I am already out when the day turns hot. The Talamahu Market is in downtown Nuku’alofa. At the Talamahu Market, baskets of root vegetables and coconuts are on display. The baskets are made of palm leaves. Vendors often sit there making the baskets while waiting for customers. Watermelons strewn on the ground. If you walk up to inspect them, a vendor approaches to help you make a selection. One side of the indoor market is for softer, smaller vegetables like tomatoes, green peppers, carrots. The other side is for crafts vendors who make things by weaving (usually using parts of the Pandanus or coconut trees) or carving (usually coconut shells or tree trunks). I bought a basket of coconuts. There were 13 in that basket, costing 10 TOP, or $6 CAD. A taxi driver showed me how use a big knife to hack open a coconut in the trunk of his cab. But it is easier to look for the eye of the coconut and poke a straw through it. A woman gave me what she said was a Tongan apple. The ‘apple’ opens like a ripe banana inside. It tastes sweet and tart, but apple flavoured. Here’s another part of downtown, full of cars and desolation. But you also find cafés like this where hip locals frequent. And sometimes, you come upon one of these – a rain tree! This is the building where Douglas works. The supermarket on the ground floor is the only North American style supermarket in town. It was destroyed in the 2006 protests for democracy. This is one of the corners that’s been rebuilt since then. That’s the Tongan flag waving. Believe it or not, there is an Apple outlet in town. The Apple shop is in this groovy little house, away from the downtown core. The shop is run by this Dutch man, who wears ear hoops, a nose earring, a dress, and runs around barefoot. He is knowledgeable and friendly but prefers that you decide on your purchases quickly. Douglas learned later this man is an astrophysicist. On Christmas day, we went to this little church to hear incredible singing. That ‘girl’ in the grass skirt is a boy. Tongan families in villages sometimes raise the youngest son to be a girl, if the family has too many sons. It’s also common for families to casually adopt children from brothers or sisters if it’s more convenient for the adopter to raise the child, as long as everyone is from the same extended family. Two strapping fellows also attended, one in his Sunday best wearing a tepenu (man skirt) and ta’ovala (woven mat), the other in casual t-shirt, shorts, and flashy red running shoes. One Sunday, we ran into some people in traditional dress, who happily posed for us. They were waiting for the king to arrive. We waited too. But when the king hadn’t come after a while, we left. They are wearing painted tapa cloth. Tapa is made by soaking and pounding the bark of the mulberry tree. The process is like making paper. The ink is made from roots of certain trees. The making and painting of tapa is a Tongan art form. This is Veu. He is my tapa teacher. That’s my tapa we just put together by gluing smaller pieces together. When the tapa cloth dries, we will trim it and I will start my painting of Tongan symbols and designs. I already envision more abstract paintings of my own design. Yup. We often cross paths with pigs roaming about. I went on a tour of the island to visit the sights. Attractions are rather underwhelming. This is the Tsunami Rock. It is made of coral and sits in the middle of a field. Theory is, a tsunami washed the coral inland once upon a time. See how these coconut trees stand… See where this coconut tree splits into two branches? This is the only coconut tree on the island with two heads. It is a tourist attraction. This is the only land bridge in Tonga. These trees bear a complex system of roots. When it’s dark, these trees can look like horses in the night. The pandanus tree bark and leaves are used for weaving. This structure is referred to as the Stonehenge of Tonga. It is a single ‘henge’ standing about 15 ft high. It is a tourist attraction. Waves crash into underwater caves and force jets of water up the ground. It does look like spray from a whale’s blowhole. 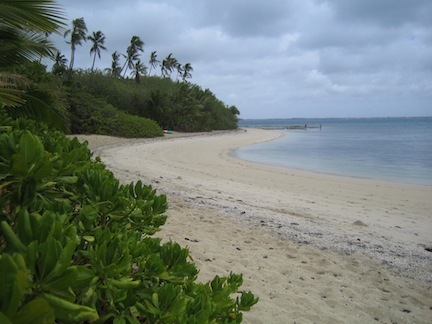 And of course, Tonga is also full of brochure paradise island bliss. This is the fale (fa-le, like chalet, but with an ‘F’) we stayed on Fafa Island, which is a beautiful resort island with white sandy beaches. And there it is, the white sandy beach with great snorkeling at your feet. Read Mary Li’s original reaction to leaving Toronto for Tonga, Little Kingdoms. This article can be found in GOING OUT, in the section Where We’re Going. Previous post ← CENTRE FOR SOCIAL INNOVATION: Can a bit of real estate change the world?